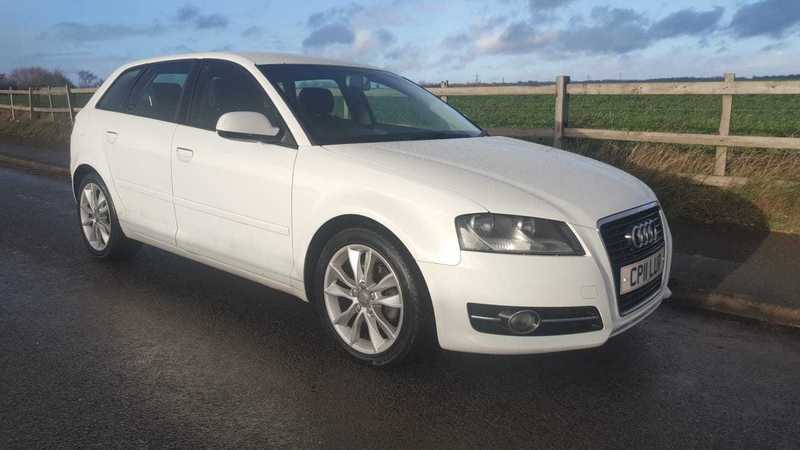 Here at Rylstone Motors, we have a stunning example of a Audi A3 2.0 TD Sport Sportback 5 doors in White. It looks and drives superb. It is also HPI clear. This is one definitely not to be missed! , AU warranty is included if on screen price is paid. This car also comes with 12 months AA breakdown cover, terms and conditions apply. We accept all major debit and credit cards. Finance also available on request. Nationwide delivery available, please contact us for further details. Test drive welcome. Part exchange is also possible. You can contact us on 07474 228082 or 07838 141786 if you have any further questions., 12 months MOT, Service history, Clean bodywork, Cloth interior - Clean Condition, Tyre condition Good, 17in x 6.5J 5 - Spoke Star Design Alloy Wheels with 225/45 R17 Tyres and Locking Wheel Bolts, Audi Chorus Radio/Single CD Player with MP3 and AUX Socket, Drivers Information System (DIS), Dual - Zone Electronic Climate Control, Electric Front and Rear Windows, Heat - Insulating Glass, Thatcham Category 1 Alarm, Air conditioning, Airbags, Aluminium Medial Silver Inlays, Anti Lock Brake System (ABS), Body Coloured Bumpers, Centre Rear Seat Belt, Child locks & Isofix system, Cruise control, Electric door mirrors, Electric windows, Electronic Differential Lock (EDL), Electronic Stability Programme (ESP), Folding rear seats, Front Centre Armrest, Front and Rear Speakers, Front and Rear Adjustable Head Restraints, Heated Rear Windscreen, Height Adjustable Seats for Driver and Front Passenger, Immobiliser, Power steering, Remote Central Locking, Upholstery - Dynamic Cloth. 5 seats, White, 2 owners, £4,995 p/x welcome.